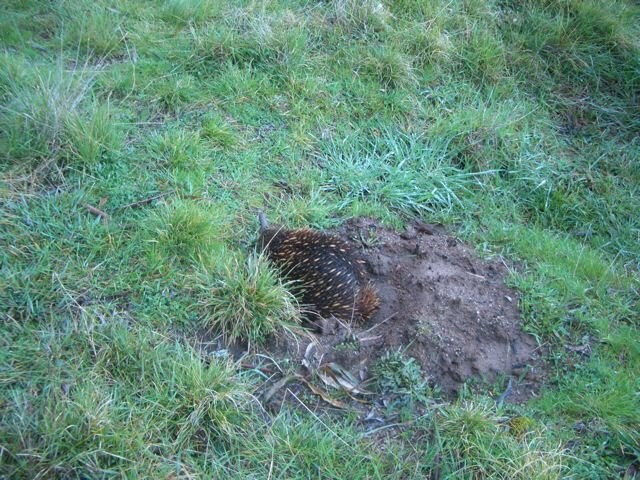 Here’s an Echidna digging for insect larvae and pupae in a poa, weeping grass, wallaby grass pasture. This one dug in when he felt me approaching, then stuck his beak up after a few minutes to test the air. In a local study in 1993-94, Echidnas were found to become inactive during the cold winter (~June, July, Aug., Sept., ), except for a brief bout of mating in late Aug-Sept. These days, it seems Echidnas up here are active virtually all year ’round. At only 560 m asl, it may not always get cold enough to send them underground. Previous Previous post: Black-faced Cuckoo-shrikes & Silvereyes are back! This reminds me of the echidna ‘nest’ I have been watching. About a month ago, a small hole amongst the grass with lots of spoil outside peeked my curiosity. What could create all that spoil and have such a small entrance hole? As I wandered around the small, grass covered mound, I accidently put my foot through a burrow and just missed a large echidna that was nestled inside. I feared that I may have ruined her nesting spot, but she has since fixed up my ‘boot hole’, has created another small hole and a larger entrance hole. I wish I had a motion/infrared camera to see how often she comes out and if there might be any puggles!